One of the most irritating questions I hear at a book discussion is: “Why would anyone do that?” My immediate response is always: “Because if they didn’t, there’d be no story to tell!” At the core of literature, of any kind of story, is people making decisions. You will either agree or disagree with their choices, but if characters always chose the most sensible options, if there were no consequences to their actions, there would be no story. It’s as simple as that. You may have also noticed that stories are rarely about people on their best days. Who wants to read about that? Only on bad or difficult days do interesting things happen, things worth reading about. To paraphrase Tolstoy: All good days are alike; each bad day is bad in its own way. To take full advantage of a fictional narrative, we’re required to suspend our disbelief and squelch the need to judge; to pat ourselves on the back and state that we’d never do thus and such. Because the truth is, we don’t know what we’d do unless we’re confronted with that same set of circumstances. Our choices might be better, or they might be much, much worse. Reading is about learning the limits of what we think we know – about life and about ourselves. This is why questioning a character’s choices never fails to set my teeth on edge. It misses the point of storytelling: which is to deliver the news that nothing in life is ever as clear-cut as we imagine it, or want it, to be. I’d only seen the movie, and that was years ago, so I decided it was time to order the book and read it. But I was unprepared for the dark journey this haunting and heartbreaking tale would take me on. Styron’s narrative requires patience – the book is long and detailed, with numerous lengthy digressions which serve the story in the long run, but which in the moment can seem frustratingly extraneous. Patience, however, is rewarded. 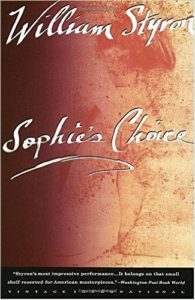 Styron creates a tight, multi-threaded web that first catches, then pulls the reader into Sophie’s personal hell. Masterfully told, alternately expansive and painfully focused, the story grabbed me and would not let me go. If you’ve seen the movie, you know the event that is the source of the title. Yet this story is about much more than one moment in Sophie’s life. 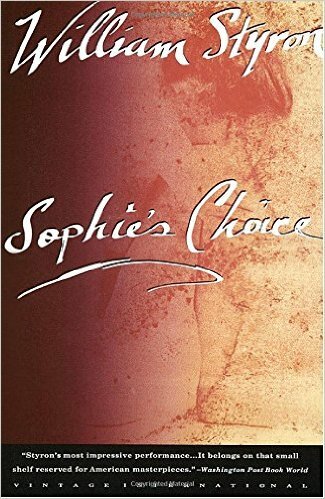 It’s about the many choices she makes throughout her life, including choices forced on her by the larger world, one of unspeakable evil. Even knowing the basic plot and the ending, I was struck by Styron’s brilliant use of the parallel stories of Nathan, Sophie, and Stingo, the narrator – how they intersect and ultimately diverge, spiraling down into madness and destruction. Styron’s masterful use of setting and foreshadowing, his deep research (you can sense the pressure he feels to get his facts right), and his genius with language make this book a literary gem. This is not a book you can speed through. If you choose to enter this fresh hell, it will hold you hostage. Styron forces the reader to look: at the most heinous event of the 20th century; and at its lasting effects on one small set of characters – one who lived it, one who feared it, and one who is only now beginning to understand his blindness to and collusion with it. Given the right circumstances, any of us could be Sophie, or Nathan, or Stingo. Styron is telling us to beware: we ignore him at our peril. My year of reading enriched my life so much that I’m planning a repeat performance. In fact, I’ve already started, and am on pace to read another fifty books in 2017. Because for some strange reason, my to-read pile is just as tall now as it was at the beginning of 2016, but with different books. How did that happen? Well friends, that’s all she wrote. Thanks for taking this journey with me. And happy reading! I ordered this book from Powell’s when I saw it was in my book group’s line-up; also, the title had been on my radar for some time. When I started it, I honestly thought it was about running. I knew the story took place in the Pacific Northwest, where I also knew, because I’d lived there for many years, that running is a popular sport. If you live in the PNW and don’t run in the rain, you’ll never run at all. Imagine my surprise when I learned the book is about race car driving. All right, I thought, here’s an opportunity to learn something new, like I did with rowing when I read The Boys in the Boat. Bring it on. I also knew that the narrator is a dog. Some readers will roll their eyes at this. But for fifteen years I wrote our holiday letter (who does that anymore?) from the perspective of our imperious cat. It was such a hit that people started sending their holiday letters directly to her, completely bypassing us. So, sure, I could accept the premise of a dog as narrator. The dog in question is Enzo (which in Italian means “ruler of the household” – a nice touch), and he speaks to us in clear and simple language. My only complaint is that occasionally he’s a tad erudite. Yes, he’s a Labrador retriever, one of the smartest breeds on the planet (and another wise choice on the part of the author), perhaps even smarter than most people. But we already have a talking dog, which requires more than enough suspension of disbelief. When Enzo speaks like a Harvard graduate, it seems to me that Stein is stretching the scenario a bit too far. It’s a small quibble, however, and did nothing to diminish my enjoyment of the book. Enzo’s goal is to be a human in his next life, and he tries valiantly to overcome his canine instincts to earn this promotion. In the time-honored method of exploring humanity through the eyes and actions of a non-human (think Mr. Spock or Data from “Star Trek”), Enzo becomes the most human character in the book. 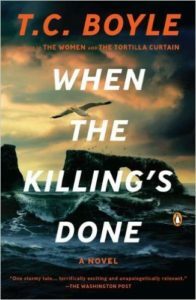 The storytelling is excellent, with life-and-death stakes, and with enough happy moments to release tension and to devastate the reader when reverses and set-backs occur. There were moments that made my blood boil, and moments that made me laugh out loud. But what I connected with most was the story’s inspirational quality. Through the medium of car racing, Enzo learns important lessons about life: it’s his path to humanity. The book is packed with such moments. 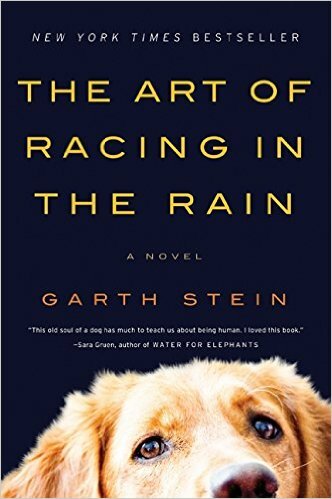 Enzo’s understanding, for example, of the notion that: “No race has ever been won in the first corner…but plenty of races have been lost there…to finish first, first you must finish,” is excellent advice on perseverance whether you’re racing, writing, or trying to lead an authentic, human life. Next time, we’ll wrap things up. See you then! As I continue on my reading journey, I find myself wanting to make up for lost time, for the years I spent reading nothing but non-fiction in my former career, the performing arts. Make no mistake, I needed those books. A college education only shows you where the key is hidden; as an artist, you have to grasp that key, fit it into the lock, walk through the door, and arrange the furniture. You have to put in the effort to own the space. I achieved that by reading every performing arts book I could get my hands on, experimenting with new ideas on myself first, then on my long-suffering students. But the arts don’t – can’t – exist in a vacuum. If all you know is your limited life, you can bring nothing but your limited point of view to your singing, acting, teaching, what-have-you. This is where fiction comes in. Through the world of fiction, we learn empathy for characters unlike ourselves. We get a glimpse into their lives, loves, and hardships. We see the workings of their minds, observe their decision-making, and witness their choices, good or bad. We begin to understand that not everyone thinks or feels as we do – and this understanding is the pathway not only to great art, but to a full and compassionate life. Good fiction lets us safely travel in another person’s shoes, but the best fiction renders us less quick to condemn the actions and choices of others, and more capable of embracing our differences. Full disclosure: Ann edited my novel. When she asked if I would accept a free copy in exchange for an honest review, I didn’t hesitate to say yes. So, I admit I was predisposed to like the book, but I often begin a book with high hopes and end up being turned off by any number of things, so I knew I could deliver a fair review. Also, I would have read the book anyway as the era and the story intrigued me (and, let’s face it, the cover is great). That it turned out to be a fantastic read was icing on the cake. 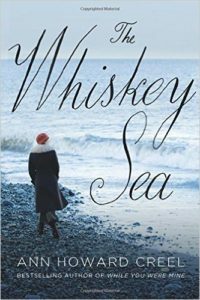 In this book, Creel plunges the reader into the era of 1920s Prohibition. But this is no Gatsby-esque narrative. By focusing on the lives of a group of poor fishermen turned rum runners – the have-nots risking their lives to secure a better life for their families, just so the wealthy can have their nightly cocktails – Creel shows us the darker side of the free-wheeling Roaring Twenties. The protagonist, Frieda Hope, is a scrappy, independent young woman who has had responsibilities shoved onto her narrow shoulders at too young an age, and she feels this responsibility deeply. Virtually alone in the world, but with her younger sister to care for, we watch Frieda grow as she navigates this tough, hard-scrabble world and ultimately learns, through the grace of forgiveness, to cast off her hard shell and let love in. All the characters spring to life on the page, and I found myself thinking about them, wondering what they would do next – that is, when I was able to put the book down. By turns thrilling and inspiring, The Whiskey Sea is a beautifully written, well-told story. Highly recommended. This book, which I picked up at a discount book store, started my mind whirring. How does one navigate and make sense of the world when you see and experience everything differently from the people around you? This the crux of Haddon’s story. On the surface it’s a who-done-it-style mystery, but Haddon also weaves into it a gripping story of the mystery of personal relations, and the problem of finding one’s place in the world. Haddon nails the experience of autism/sensory processing disorder. There is much of this in my family; my husband and I each have a touch of it ourselves. While reading, I had many “how did he know that?” moments of recognition. I also found it a delightful read and nearly impossible to put down. That it is a short and charming story does nothing to diminish the book’s importance. I understand that a stage play is being made from the book; I can only hope it conveys Christopher’s story as sympathetically as the book. No one who reads it will see life in quite the same way afterward. The more I began to read, the more realized that there were worlds out there – worlds of thought and of action – that I’d never I imagined before. I’d been taught to think inside a tidy little box, to learn and to parrot back the right answers, to never question received conventions. But I did have questions and quandaries, and nowhere to explore or express them. Music opened the door and took me over the threshold, but reading kept me in the room. I hungered for huge stories; stories that made me think and feel. I sought books that got under my skin as I read them, and that stayed with me afterward. I didn’t care if the books were old or recently published. I still don’t. A book doesn’t have to be popular to suit me. It doesn’t have to be made into a movie. I look for authors who can take me into unfamiliar territory, emotionally and physically; authors who can show me life from a different or surprising perspective. And I want them to do so with vivid language, unforgettable characters, and heart-pounding situations. I can always count on T.C. Boyle to deliver a fascinating tale, so I didn’t hesitate when I saw this book on a discount table; I grabbed it and I’m glad I did. Boyle possesses one of the most incisive literary minds of our time, and this is my favorite novel of his to date. I loved his interesting (and occasionally infuriating) characters, masterful storytelling, phenomenal writing, and wicked sense of humor, all of which combine for a thoroughly engrossing narrative. A bonus was learning about – experiencing, actually – an area of the California coast and Santa Barbara Islands that I knew little about, even though I grew up in California. Boyle’s engaging writing made me feel I was there. One small criticism is that the multiple, parallel timelines occasionally made for confusing reading. But perhaps there’s method in Boyle’s madness. His characters inhabit a landscape of moral conundrums, sailing in murky waters, where the answers – and even the questions – are rarely in black and white. This serves to make the reader see, even if the characters don’t, that the world’s problems aren’t as easily parsed as the media, social media in particular, would have us believe. By pitting park rangers against environmentalists Boyle creates a Mom-versus-Apple Pie scenario rife with conflict and misunderstanding. If everybody’s right, then who’s wrong? Who is the real villain? You’ll have to read the book and draw your own conclusions. I was not a reader as a kid. Not even close. Music was my obsession, and I spent most of my childhood plopped in front of my record player, alternately immersed in rock ‘n roll and classical music. I read when I had to for school. When my class would visit the school library, I could never find anything I wanted to read. All the books seemed dumb and uninteresting – kid stuff. That changed the summer I turned eleven. My mother, in a last-ditch effort to stop my incessant whining about being bored, dropped a copy of Gone With the Wind in my lap (we won’t for the moment discuss the wisdom of giving that particular book to a sixth-grader; my mom was desperate). I was skeptical, I mean, a book? But after a few pages I was hooked. What wonders a book could contain! What big stories and captivating characters! What heart-stopping and riveting situations! Now, this was a book! I re-read it every summer for years. Then in high school, To Kill a Mockingbird ensnared me just as completely – to the point that I missed dinner (if you know me at all, this is a huge thing). By my senior year, thanks to a stellar English teacher, I’d added Shakespeare and Steinbeck to my short but growing list of favorite authors: writers who tell universal stories about flawed, tragic people; about characters fighting for their very survival, battling circumstances of their own making, or imposed on them from the outside. Even better if it’s both. I see now that even then, I was taking my first tiny steps into the world of storytelling. This is another book I picked up at my local library book store (to be honest, I liked the cover; if you’ve ever wondered if covers sell books, they do). David Guterson, who also gave us Snow Falling on Cedars, delivers an extended reflection on life and death as told through the actions of Ben Givens, a retired heart surgeon. 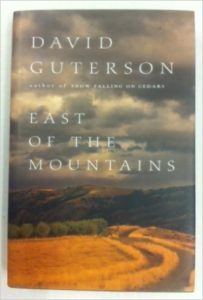 When Givens is diagnosed with terminal cancer, he decides to make one last visit to the land of his birth “east of the mountains” in Washington state. Planned as a hunting trip, Givens’ intent is to end his life by shooting himself with a family heirloom rifle. But this man, who survived the horrors of the Second World War, and as a result dedicated his life to helping others survive, is true to his name: he can’t stop giving to others. His situation is hopeless, yet he unearths nuggets of hope to give to others during the course of his personal odyssey. One wonders if, when the time comes, Givens – who is deeply attached to life – will be able to pull the trigger on himself. Normally, I’m not a fan of long passages of description, and there is quite a bit of it here. But in this case I was pulled through the book by the breathtakingly beautiful and vivid writing. The back story is also delivered in large chunks, but instead of distracting from the narrative, it serves to fill out the reader’s perception of the protagonist. Throughout the book, events turn the main character like a prism, so that we see Givens and his situation in continually new light. Additionally, the story is filled with memorable characters who alternately deflect and aid in the course of Givens’ journey. This beautiful story will stay with me for a good long while. While not a new book, I highly recommend it for the quality of the writing, and the profound story it tells. A book this rich and deep never ages.